William V. Johnson, Professor Emeritus at California Polytechnic State University, San Luis Obispo, California, served as the university‘s Director of Bands and Coordinator of Instrumental Music for 44 years. Johnson now serves as the Musical Director of the San Luis Obispo Wind Orchestra and is a consultant for World Projects International Music Productions. From his arrival on campus in 1966 until his retirement in 2010, Cal Poly’s wind and percussion ensembles, under his direction, have distinguished themselves with performances at important international musical events in Vienna, Austria in 1975 and Geneva, Switzerland in 1983. His wind ensembles have performed at national conventions of the American Bandmasters Association and at regional conferences of the College Band Directors National Association. His groups have gone on concert tours of Japan (1988), performing in venues such as Beethoven Hall in Tokyo and New Zealand and Australia (2000), performing in the Michael Fowler Centre in Wellington, New Zealand, the Sydney Opera House and the Sydney Town Hall. The ensemble made its Carnegie Hall debut in 2003 as the Showcase Ensemble for the New York Wind Band Festival. In 2006, the Cal Poly Wind Ensemble and Choir went on a European tour performing in major concert halls in Budapest, Vienna, Salzburg, and Prague. In June 2010, the Wind Ensemble performed in the Walt Disney Concert Hall as a part of the Los Angeles International Music Festival. 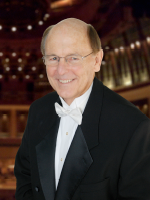 As a consultant for World Projects International Music Productions and as a freelance conductor, Professor Johnson has conducted wind ensembles and orchestras in the United States, Japan, Germany, France, The Netherlands, Czech Republic, Great Britain, Switzerland, Austria, New Zealand, Australia, Hong Kong, Israel, Korea, Singapore, and China. For two years, 1993-1995, Johnson served as the President of the World Association for Symphonic Bands and Ensembles (WASBE) and secretary of that association from 1987 to 1991. He was the Executive Director for the International Conference for Conductors, Composers and Publishers held in Manchester, England in 1981, an event that resulted in the formation of WASBE. He was the Conference Chairman for the 9th WASBE Conference held in San Luis Obispo, California, July 5-11, 1999. He is currently the Chairperson of the WASBE Foundation. Johnson was elected into the American Bandmasters Association in 1984 and served as host for the 73rd ABA convention held in San Luis Obispo in 2007. He is also a member of the College Band Directors National Association and is past President of the Western Division. He is a life member of Kappa Kappa Psi national band fraternity and was the Sponsor of Cal Poly‘s Iota Pi Chapter. He served as Kappa Kappa Psi‘s national Vice President for Professional Relations.